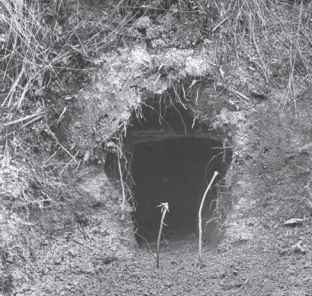 An adult wombat, with a number of well-established burrows, probably rarely initiates a new burrow, although it frequently extends and renovates existing ones. A young wombat, however, particularly one that has recently become independent of its mother, will often appear to be deliberately seeking out a place to begin a burrow, pausing frequently in its grazing to investigate exposed ground at the bases of trees and rocks, weaknesses under large exposed tree roots, butts of fallen trees, root holes where trees have burnt out either completely or partially, and similar places. A few exploratory scratches with the front paws are enough to indicate to the wombat whether or not the site has possibilities, and it will then either move off to look for another site or settle down to digging in earnest. Standing with the back legs firmly braced, the wombat begins to dig with its front paws, scratching with one paw for a few moments and then the other (Figure 3.9a). As the strong, spade-like claws loosen the soil, the broad palms scoop it up and thrust it out sideways and backwards (see Plate 10). Any grass or other vegetation encroaching on the opening is bitten off and eaten if edible or cast aside if not. If a root, large or small, is uncovered, it is gripped in the teeth and either bitten off or pulled free, and obstinate stones or lumps of hard-packed soil or clay are often bitten in attempts to free them from the surrounding soil. When some loosened soil has accumulated the back legs are brought into play, vigorously kicking and pushing the soil backward. After more energetic scratching with the front paws and backward thrusting with the back ones, the wombat will move backwards slowly, using all its paws to push the loose soil behind it, away from the digging site, often pausing to kick with the back legs (see Plate 11). In this way it gradually produces a kind of ramp, an entry-way that slopes up to the mound of soil that accumulates at the top of it. After about 20 minutes of concentrated digging, the wombat usually sits down on the ramp for a short rest, often scratching an ear and shaking its head vigorously to free it of dust and dirt before resuming digging activities. In this way a hole is created in a very short time. To enlarge it, the wombat will frequently lie partly on its side, legs still braced (Figure 3.9b), or even completely on its side, scratching at the walls and roof of the tunnel, before standing again to eject the soil (Figure 3.9c). A wombat will dig into most kinds of soils, sand or clay, according to the prevailing conditions in the district. In some areas burrows are even dug in gravelly, stony ground. The slope of the ground and the resulting drainage conditions probably influence the wombat's choice of a burrow site, but the most important factor in this choice appears to be the presence of natural weaknesses in the ground.